Scunthorpe United chairman Peter Swann says he "made a mistake" in giving sacked manager Nick Daws the permanent job after his caretaker spell. Daws, 48, took on the job in May after helping the Iron to the play-offs during his stint as interim boss. However, despite beating Coventry on the opening weekend, Scunthorpe are now 18th in League One following heavy defeats by Sunderland and Fleetwood. "This was not a great decision by me," Swann told BBC Look North. "For us we're just not seeing the returns we would hope to at this particular stage. "It's not just down to the poor results, it's something we feel is necessary to get us back on track. "I think a lot about Nick, he's a great coach but sometimes you make a mistake." Assistant boss Andy Dawson will take charge of Saturday's League One game against Barnsley. Swann has intimated that the next appointment at Glanford Park will be a more established figure. Daws had joined Scunthorpe as first-team coach from Queens Park Rangers in 2014, working under then-boss Mark Robins and then serving as assistant to Graham Alexander before Alexander's exit in March. "There's a huge difference between a coach and a manager," Swann added. "It's a lot harder now to have a brand new manager in League One, and a successful manager. It's very difficult. "I have to make a decision based on what I see everyday and what I know Nick to have done over the past four years and I felt I needed someone more experienced at this stage now. "We need someone to take us through and integrate our players we've got now and build ourselves into a team." 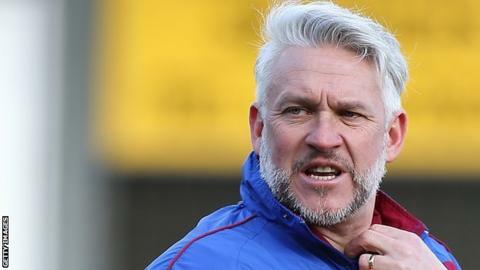 The reaction of many looking on from the outside will likely be 'but Nick Daws only had five games in permanent charge? ', which would be a reasonable thing to ask. However, a 5-0 home defeat by Fleetwood - a side you are expected to compete with - was always going to test the resolve of chairman Peter Swann and seemingly it was enough for him to act. There is no getting away from the fact that in addition to Wednesday, the Iron were just as poor against an impressive Sunderland last weekend and, to a lesser extent, in the cup defeat by Doncaster. Although having lost a number of key players in the summer, questions have and will continue to be put forward if Daws was given ample resources to replace those departing figures. The opening few games suggest not, but is three weeks of a new season really enough to judge a manager that was backed to be "the man'" only three months earlier?